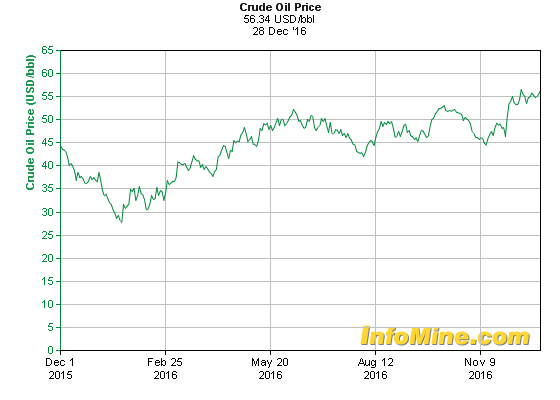 The last week of 2016 has seen Brent crude oil trading at about US$56 a barrel and WTI about a dollar lower. The year started on a disappointing note with crude prices falling to a 12 year low of $26.21 a barrel in Feb as investors worried about the oversupplied market. Oil was below US$45 for most of the first quarter. Prices have spiked to the US$55 range since November after a decision by OPEC that states that with effect from January 2017, most members of the Organization of the Petroleum Exporting Countries and 11 other non-cartel producers will start scaling back production. The reduction goal of roughly 1.8 mln barrels will happen in phases. This is seen as a bold but not unexpected move as well as a desperate bid to put a floor on falling oil prices. Crude futures continued their end-of-year rally, taking oil to its highest finish since July 2015 on expectations that global oil producers will honor a landmark agreement to reduce supply. It seems that oil prices are set to recover in 2017 as production cuts help to rebalance an oversupplied market and that producers have established a monitoring committee to ensure that output cuts are adhered to. The fall in oil prices can be majorly pegged to the simple economics of supply and demand. Near doubling of domestic production in the United States has drastically cut exports. Oil from Saudi Arabia, Nigeria and Algeria once sold in the United States are now scrambling to find new takers and compete in the Asian markets, along with rising oil production and exports from Russia, Canada and Iran. This has compelled producers to drop prices. As per nytimes.com- on the demand side, the economies of Europe and developing countries are weak and vehicles are becoming more energy-efficient. So demand for fuel is lagging a bit, although there are signs that demand is growing in the United States and China. U.S. shale gas industry also went through its share of rough times with reduction in investments and production declines in the past 18 months. As per nytimes.com, in the United States, there are now virtually no wells that are profitable to drill. Chevronn, Royal Dutch Shell and BP have all announced cuts to their payrolls to save cash, and they are in far better shape than many smaller independent oil and gas producers. Exxon has reported record-low quarterly profits, and was recently stripped of its top AAA credit rating. States like Alaska, North Dakota, Texas, Oklahoma and Louisiana are facing economic challenges. As per Platts, unlike ethane, naphtha is highly correlated with the price of oil. Therefore, fluctuations in global oil prices will have a major impact on steam crackers, more so in Europe and Asia where most producers utilize naphtha as a feedstock for producing ethylene. It is well known that shale-driven ethylene expansions are taking place in the North American market. The question is, will these growing supplies of olefins outstrip the ability of units downstream to take in product? US ethylene production is at an all-time record level, according to data from the American Fuel and Petrochemical Manufacturers association. Data for Q1-2016 showed that ethylene production was at 6.857 mln mt, down fractionally from the previous quarter but nearly 10% higher than the level from Q1-2015. The production growth is due to cracker project expansions and strong utilization on the Gulf Coast. LyondellBasell brought online an expansion at its Corpus Christi facility in H2-2015 and utilization rates are estimated at about 94%. Meanwhile, downstream ethylene demand kept pace, but by the slimmest of margins. Production of polyethylene - the main end-use derivative for ethylene - climbed from 4.18 million mt in Q1-015 to 4.5 mln mt in Q1-2016. Ethylene conversion into polyethylene is roughly 1:1. Most of the new shale-driven cracker projects are well underway and are expected to be completed in the next few years with majors such as ExxonMobil, Dow and CP Chemical bringing online in excess of 7 million mt of ethylene capacity by 2019. Platts analysis shows that the ethylene market in the US will be balanced with 5.8 mln mt of polyethylene capacity, 1.7 mln mt of monoethylene glycol capacity and a slight increase in ethylene dichloride capacity brought online over the same time frame. Meanwhile, the projected balance for the propylene market is less stable. With the increase in lighter feedstock cracking the US has seen production of cracker co-products drop off over the past 10 years. In addition, new crackers being built in the US are all geared at maximizing ethane consumption, which produces lower levels of propylene, crude C4s and aromatics. However, there will be a large increase in the amount of on-purpose propylene production over the coming years as producers try to plug the propylene hole and take advantage of low propane prices. The total increase in propylene production is expected to be about 2.2 mln mt by 2019, or 20% higher than the current levels. But, unlike the ethylene market, the increase in propylene production won’t be matched by an equivalent build out in the downstream derivatives market. However, recently, BASF planned to postpone a decision on a natural gas (methane)-based propylene investment in Freeport, Texas due mainly to the current uncertainty in oil prices causing volatility throughout the whole energy complex. If this trend continues, we may see a drop in this potential 20% increase in propylene production. Platts estimates show that polypropylene demand for propylene will only amount to about 500,000 m tpa of demand. The expected length in the US propylene market could be met by additional polypropylene lines as the US looks to fill holes in the Canadian and Mexican market polypropylene markets. Or the US could look to export larger amounts of propylene. The market only currently has around 600,000 m tpa of propylene waterborne export capacity but this could increase in the coming years as well.